I have created a model with ModelBuilder to interpolate values with the IDW tool, iterating through rows. How can I restrict interpolated values to regions within a 20km buffer? I tried setting the "search radius" to 20km, but that only prioritizes points within the radius - the radius increases until the minimum number of points is encompassed. 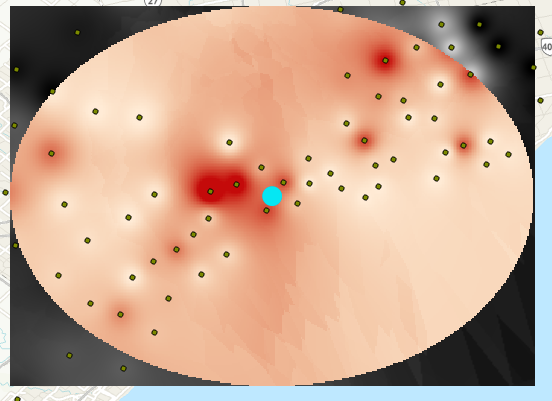 Instead, I want anything outside of the search radius to be set as missing or no data. The IDW tool accepts extent as an environment condition per the doc. If you add the Buffer tool to your model, you can use the output of buffer to set the extent that the tool will process. See the graphic on hooking up the output into IDW. The "extent" of buffer will be a rectangle/square looking shape. If you want to "clip" the output of your analysis to the buffer, hook up the Mask environment in the exact same way. From the 2nd screen shot you can see just using Extent and the black/white output. The White/Red output over top makes use of both Mask and Extent. Not the answer you're looking for? Browse other questions tagged arcgis-desktop modelbuilder buffer inverse-distance-weighted or ask your own question. How to set a minimum point snap distance? How to do a Loop with a condition in Model Builder?